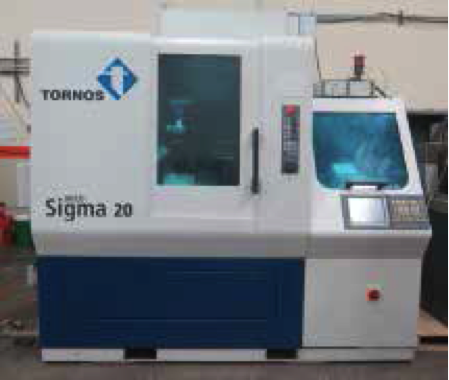 2007 Tornos DECO Sigma-20 6-Axis Sliding Headstock CNC Screw Machine s/n 8596 w/ Fanuc Series 31iAControls, 20mm/.787” Cap, 10,000 RPM on Main and Sub Spindles, 10,000 RPM on Rotating Tool Positions, 64kb Memory, Headstock C-Axis @ 0.001 Deg, Positioned Indexing S4 @ 0.001 Deg, Coolant Thru Tools Option, X1/Y1 Linear Tooling 2-Axes with 14 Tool Positions, X4/Y4 Linear Tool System 2-Axes with 8 Tool Positions, Axial Double Ended 2-Spindle Attachment with 10,000 RPM, HF Rotating Drilling/ Milling Spindle @ 10,000 RPM, Milling Function C1 and C4 Simultaneously, C4 Axis Function @ 0.001 Deg, Pneumatic Part Manipulator, Part Extractor, High Pressure (2000 PSI) System, Robobar SBF-532 4M Automatic Bar Loader / Feeder w/ 5mm/.196” to 32mm/1.259” Bar Cap, 4200mm/165.35” Bar Length Cap, Remnant Ejection. Hardinge Conquest T42SP Super Precision CNC Turning Center s/n SGA-1776-B w/ Fanuc Series 18-T Controls, 12-Station Turret, Tailstock 16C Spindle, 7” 3-Jaw Power Chuck, Coolant, 2,793 Hours. Hardinge Conquest T42SP Super Precision CNC Turning Center s/n SGA-1702-B w/ Fanuc Series 18-T Controls, 12-Station Turret, Tailstock 16C Spindle, 7” 3-Jaw Power Chuck, Coolant, 21,562 Hours. Deckel MAHO DMU50V 4-Axis CNC Vertical Machining Center s/n 054820 w/ Deckel Mill Plus CNC Controls, Dual 12-Station ATC’s (24-Stations Total), 4 th Axis Thru Table, 15” x 19 ½” Table, Travels X=500mm/19.685”, Y=380mm/14.96”, Z=380mm/14.96”, Coolant, 15,092 On Hours, 1,984 Run Hours. Bridgeport / EZ-Trak 2-Axis CNC Vertical Mill s/n 278320E w/ EZ-Trak BPC2M Controls, 2Hp Motor, 60-4200 Dial Change RPM, Power Draw Bar, 30-Taper Adaptor, Chrome Ways, 9” x 48” Table. 1997 Charmilles Roboform 31 CNC Die Sinker EDM Machine s/n 32.562.00.000 w/ Charmilles CNC Controls, 15-Station ATC, Remote Hand Controller, C-Axis, Travels X-14”, Y=10”, Z=12”, Ebbco Dielectric Cooling and Filtration System. 2000 Elenix / Current EDM “EDM Drill ST300” EDM Drilling Machine s/n 83217 w/ Elenix Controls, 11 ¼”x 11 ¼” Table, Coolant-System. Hardinge TFB-H Wide-Bed Tool Room Lathe s/n HLV-H-9244-T w/ 125-3000 RPM, Tailstock, Power Feeds, KDK Tool Post, 5C Spindle, 6” 3-Jaw Chuck, Coolant. Harig 612 6” x 12” Surface Grinder w/ Walker Electromagnetic Chuck, Turcite Ways. Deckel mdl. SO Single Lip Tool Grinder s/n 94-25838 w/ Diamond Grinding Wheel, Collets. Dayton 3/4Hp 8” Bench Grinder. Deckel mdl. GK21 Pantograph Machine s/n 11104 w/ 7 ¾” x 14” Work Table, 12 ½” x 20 ½” Template Table, Templates and Stencils. Nugier H40-14PD 40 Ton Sliding Ram Hydraulic H-Frame Press s/n 0685008. 2007 Airflow Systems “Easy Bench” mdl. BF4 Down Draft Deburring Table s/n 1026353. Central Machinery 7” Horizontal Band Saw w/ Manual Clamping, Work Stop, Coolant. Cyclone Bench Model Dry Blast Cabinet. Donaldson Torit mdl. VS2400 Dust Collection System s/n IG537854-001-1. (4)Kurt D688 6” Angle-Lock Vises. (500)5C Collets and Step Chucks. (3) Walker 10” x 15” Magnetic Chucks. Norman Schmidt 6” x 12” Magnetic Sine Chuck. (2) Suburban 6” x 12” Magnetic Chucks. Harig Grind-All No.1 Precision Spin Fixture. 3” and 4” Precision Sine Vises. 2” and 4” Precision Vises. (3)St. Mary Mfg Spin Rolls. 10” x 15” Adjustable Angle Plate. (3)10” 3-Jaw and 10” 4-Jaw Chucks. NSK “Sonic Cutter” Die Filer Systems. Magnetic V-Blocks, V-Blocks, 1-2-3 Blocks and Parallels. (2) Fastenal Double-Sided Hardware Cabinets (NEW and FULL). 2005 Mitutoyo Crysta-Apex C776 mdl. 4062M-3113 CMM Machine s/n 0497506 w/ Renishaw PH10MQ Motorized Probe Head, Renishaw MRC20 6-Station Probe Tip Changer, Joystick Controller, X= 705mm (27.76”), Y= 705mm (27.76”), Z=605mm (23.82”), MCOSMOS1 Software. Mitutoyo PH350 14” Optical Comparator s/n 7070 w/ Mitutoyo DRO, Surface and Profile Illumination, Stand and Acces. w/ type CR30th Heads and Tooling. Obishi Seiko 12” x 18” bench Center. Mitutoyo 6” x 12” Bench Center. Mitutoyo Gage Block Sets and Accessory Set. Mitutoyo 1”-2” and 0-1” Indicating OD Mics. Mitutoyo and Tesa Thread Pitch Mics to 4”. Mitutoyo 0-1” Digital OD Mic. Digital and Dial Calipers to 18”. (2)48” x 72” Steel Die Tables. 48” x 48” x 6” (Solid) Die Table. Heavy Duty Storage Rack w/ (2) 2000 Lb Cap Roll-Out Shelves. Electrical Transformers 225kVA 480-240, 30kVA 480-240, 30kVA 480-240/120, (2)15kVA 480-208Y/120, Breaker Boxes, Disconnects and Conduit. (2) Carrier AC Units w/ Ducting.